The new mineralization was intersected in DDH ML-18-017 located between the historical Waterhole Showing (Au-Ag-Zn) and the Kell’s Showing (Ni-Cu-PGE). Please refer to the October 1, 2018 and October 24, 2018 press releases for full details of these previous released drill results. Additional anomalous gold-silver-zinc values were intersected in DDH ML-18-013 and ML-18-015 to the north of the discovery hole that were targeting the historical T25 trench and its possible northern extensions. Gold-silver-zinc mineralization is contained in several sections that range from low to high values and are typically hosted within sheared and carbonatized porphyritic trachyte and porphyritic/fragmental trachyte units and to a lesser extent by a porphyritic andesite unit. These gold-silver-zinc values occur in drillholes ML-18-013, ML-18-015, ML-18-016 and ML-18-017. The new gold-silver-zinc mineralization intersected in ML-18-017 is associated with a sheared and brecciated section of porphyritic/fragmental trachyte unit. It is strongly carbonatized and moderately chloritized, with local moderate silicification, strong albitization, strong oxidation on fracture surfaces and a late white mica alteration overprint. This interval contains very high amounts of pyrite with a high percentage of intergrown sphalerite in quartz-carbonate-chlorite veins and has silver associated in moderate to high amounts. The trachyte lies between an upper porphyritic andesite unit and a lower aphanitic andesite unit. 46.20 – 57.6m: Aphanitic andesite is moderately silicified with local weak to moderate chloritization, carbonatization and strong albite alteration. Contains a hydrothermal brecciated section with very high percent pyrite and sphalerite. Locally moderate to high percentage of fracture-filled and disseminated pyrite and sphalerite and very high amounts of pyrite and low percent sphalerite in veins that appear to be sheared (host rock not sheared). Pyrite and sphalerite are typically intergrown. From 46.2 – 52.4m exhibits low to moderate values of Ag and Zn. 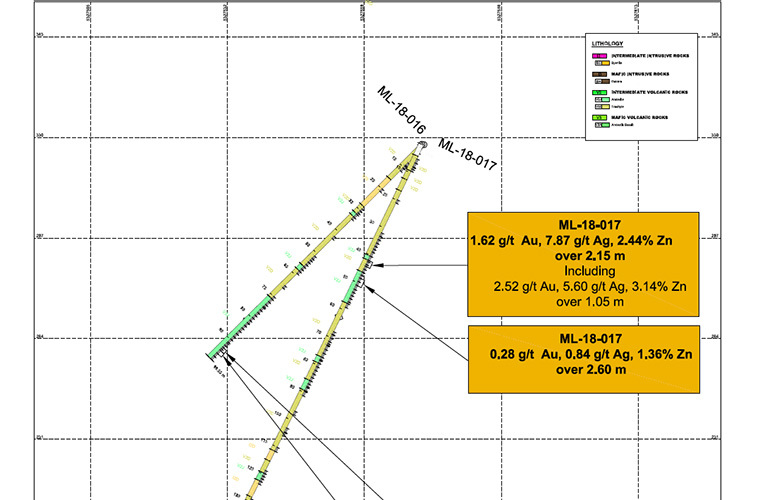 Based on the drill results from this first-phase drill program, it is unclear presently if the gold-silver-zinc mineralization intersected in ML-18-017 represents a new mineralized horizon or the possible extensions of the historical Waterhole Showing, T25 Trench and/or Kell’s Cabin Showing. Further fieldwork activities including additional diamond drilling will be required to verify the new zones spatial relationship with other historical showings and trenches. A compilation -DDH Plan map and ML-18-017 cross-section may be viewed on the Cleghorn website (compilation map and cross-sections). *Reported drill intercepts are not true widths. At this time there is insufficient data with respect to the shape of the mineralization to calculate true orientations in space. 1.62g/t Au, 7.87g/t Ag & 2.44% Zn over 2.15 metres, including 2.52 g/t Au, 5.60g/t Ag and 3.14% Zn over 1.15 metres intersected in ML-18-017, and representing a new drill discovery on the property. 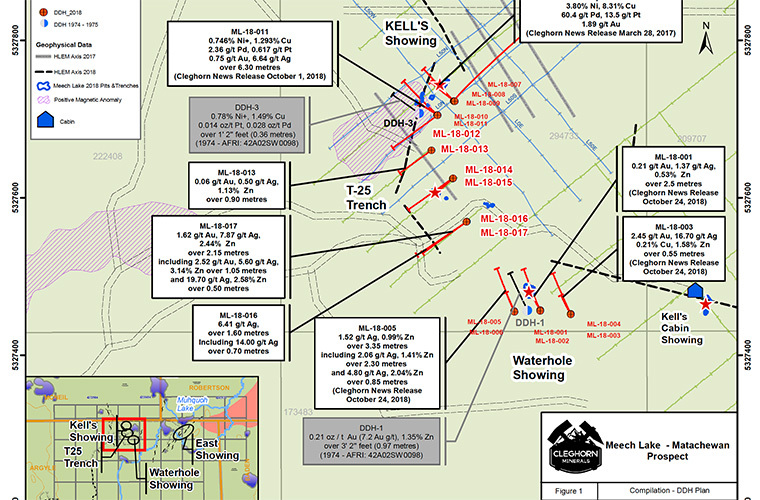 A program of detailed mapping and surface sampling is recommended over the Kell’s Showing, Waterhole Showing, T25 Trench and Kell’s Cabin Showing in an effort to define and characterize the surface mineralization outlined in the 2018 surface stripping and drill program. Based on the results of this work, additional detailed magnetic, 3D induced polarization and electromagnetic surveying are planned with the objective to aid in the tracking of the nickel-copper-PGE and gold-silver-zinc mineralization along strike and down-plunge for follow-up drill targeting. Following the MLAS claim to cell conversion process completed by Ontario’s Ministry of Northern Development and Mines (MNDM), the four (4) original legacy claims covering 656 ha were converted to 41 cells (36 single cells and 5 boundary cells) covering an area of 833.6 ha. All diamond drilling sample batches (each individual hole), include 5% QA/QC samples consisting of blanks and certified standards (Natural Resources Canada - CANMET). All drillhole samples were submitted to ALS Minerals, an accredited mineral analysis laboratory. Sample preparation was completed in Val-d'Or, Québec and analyses in Vancouver, British Columbia. Nickel, copper, cobalt, zinc and silver values were determined by a 61 element, Four Acid / ICP-AES analysis and gold values were determined by a 30-gram fire assay and AAS finish. Platinum, palladium and gold values were determined by 30-gram fire assay with ICP finish. Samples, which received over-limit values, underwent further analysis using ALS Minerals assay procedure Ni-OG62 (for nickel), Cu-OG62 (for copper), Zn-OG62 (for zinc), and PGM-ICP27 (for gold, platinum and palladium). The reader is referred to: www.alsglobal.com for details of analytical procedures described above. Cleghorn Minerals has applied a rigorous quality assurance/quality control program at the Meech Lake Project using industry practice. All core was logged and selected intervals sampled by a professional geoscientist. NQ drill core was sawn in half and each sample half was placed in a marked sample bag with its corresponding sample tag, then sealed. The remaining half core is retained in the original core boxes that are stored in a secure facility in Val-d’Or, Québec. Michael P. Rosatelli, P.Geo. and senior consultant to Cleghorn, is the designated “qualified person” as defined in Section 1.2 in and for the purposes of National Instrument 43-101 that reviewed and approved the technical content of this release. Cleghorn is continuing due diligence on several property and/or transactional opportunities, in Canada and separately, located in International jurisdictions, and will provide additional information should the examinations lead to favourable conclusions and affordable transactions. Cleghorn is a junior mineral exploration company with a 100% interest in the Meech Lake – Matachewan Prospect, a property located in northeastern Ontario, subject to an aggregate 3.5% NSR.